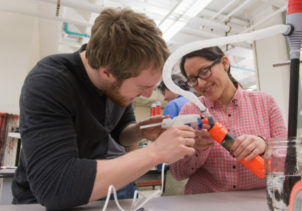 Next summer, a newly launched Invention Accelerator will train undergraduate students to “design, prototype and pitch” as they develop tangible products. A collaboration between the College of Engineering & Computer Science, the College of Architecture and VPA’s School of Design, this immersive, six-week program will be held on the Syracuse University campus and at the SU Fisher Center in New York City. Students work on their invention. Students can learn more about this exciting opportunity at two general information sessions on Monday, Oct. 31. Pizza will be served. The Accelerator follows a proven method of developing students’ abilities to innovate and communicate. Students will learn about design, ideation and intellectual property, then conceive an original invention, prototype the invention and refine it in response to weekly feedback from diverse audiences of guest evaluators. daily lunch, coffee and snacks. The Accelerator will take place May 15-June 23, 2017, at Syracuse University and May 22-June 30, 2017, at the Fisher Center.